The science fiction novel Journey to the Center of the Earth by the legendary Jules Verne is a recognized literary classic. Originally penned in 1864, it has been in constant print since, and has spawned no less than five film versions and numerous television adaptations. The fanciful story of the exploration ofthe earth’s core continues to fascinate readers and viewers. What is surprising is that it took so long for the novel to be the subject of a board game. 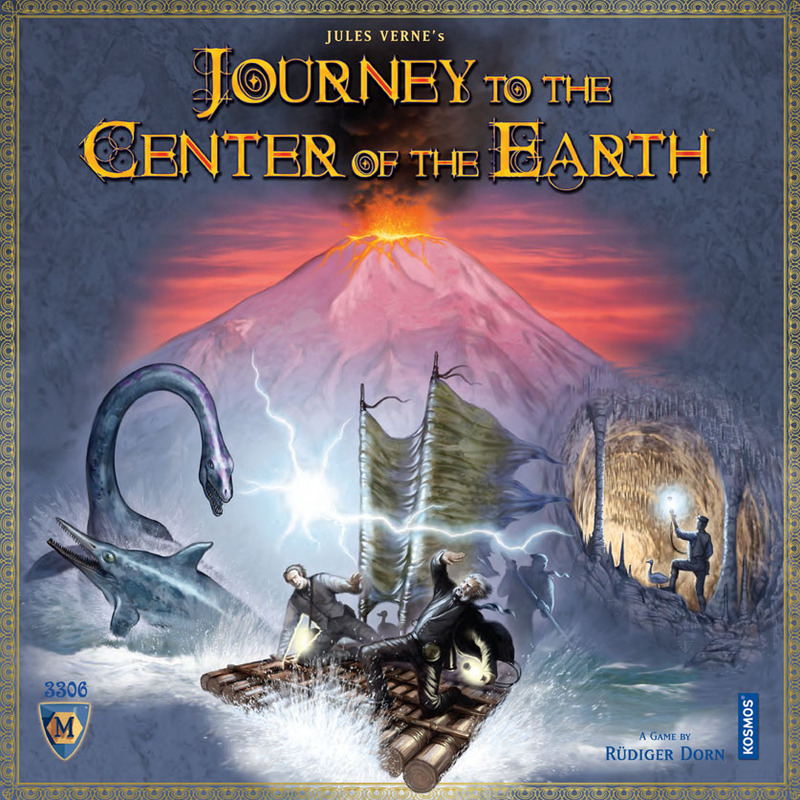 Designed by Rüdiger Dorn, Journey to the Center of the Earth takes players to the earth’s core in search of rare fossils, precious metals and gems. This is done by moving explorers through caverns, across a subterranean lake, and finally, along a flowing volcano back to the earth’s surface. This is accomplished by collecting and playing cards, which are used to move the explorers, overcome obstacles, and dig for fossils. Three explorer pawns begin at the entrance to a massive, deep cavern. Players begin with six explorer cards and three equipment cards, which will be used to navigate the depths. Three equipment cards are revealed, and play begins. Each turn, players may draw new explorer and/or equipment cards, or move an explorer. Players do not own a specific explorer. Rather, a player may choose to move one of the three explorers by playing matching cards. Explorers may move laterally, but must also descend at least one space when being moved. Each space moved into requires the expenditure of one card, but obstacles will also require the expenditure of the appropriate equipment or additional movement cards. For example, in addition to a movement card, boulders can be overcome by expending a pick axe or additional movement cards, while a chasm requires a rope to pass. Thus, the idea is to collect a handful of cards – both movement and equipment – in order to make steady progress down the cave. There is a firm hand limit of ten explorer and five equipment cards, which forces players to move the explorers regularly. The ultimate objective is to reach spaces where you can dig for fossils and gems. These spaces depict one or more equipment icons and matching cards must be played in order to draw fossil cards. One card is drawn for each equipment card played, so the spaces with multiple icons tend to yield greater results. By playing an electric light card, a player may draw extra cards in order to increase the odds of drawing specific fossils being sought. There are a variety of fossils. Some are completed with just one card while the more valuable fossils require multiple cards to complete. Gems – gold or quartz – increase in value with each one collected. Drawing for fossils and gems is certainly a game of chance, but as mentioned, the odds can be swayed a bit by regularly digging, and supplementing equipment cards by playing electric lights. When one explorer reaches the bottom of the cave, all other explorers are moved to that location, and the active player receives a bonus in the form of the “mushroom forest” card, which is worth four points. At this point, all players must discard one water-stone for every three fossils or gems they possess. If they are unable to surrender enough stones, they must discard any excess fossils. Water-stones are collected by moving over certain spaces in the caves. Excess water-stones are worth one victory point at game’s end. It is wise to collect as many water-stones as possible, lest one run the risk of losing valuable fossils. The lake phase is played much like the caverns but all explorers move together on a raft. Digging is a bit different, as each player has the opportunity to play the required equipment cards and draw fossil cards. After the boat is moved, a Sea Adventure card must be drawn. These cards can either reward players with additional fossils or require the players to discard fossils. The cards depict one or more explorer cards which must be discarded in order to receive the reward or avoid the consequence. In the case of positive adventures, the first player to successfully discard the depicted cards receives the reward. In the case of the negative “ball lightning” cards, the first player who cannot play the required cards suffers the loss of a fossil card. Thus, it is wise to continually refurbish one’s hand of cards while during the lake phase. 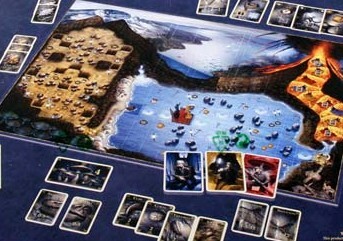 When the far side of the lake is reached, the active player receives a bonus victory point card, and all players discard their explorer cards. The final journey through the volcano will be quick, but potentially painful. Each turn, an explorer and equipment card is revealed. The raft moves to the next space that matches the color of the explorer card. Each player must then discard a card that matches the revealed equipment card. If unable to do so, the player must discard a fossil. This will likely cause the player to lose victory points. This process continues until the raft exits the volcano, thereby ending the game. Players tally the value of their fossils, gems and water-stones, with the victory going to the player with the greatest total. When I first played Journey to the Center of the Earth back in April 2008, I didn’t care for the game. Perhaps it was due to the setting, which was late at night at a gaming convention, and everyone was new to the game. We fumbled through, and the game seemed to drag on longer than the fun derived. I did not seek to play it again but ultimately did when I received a copy. I fully expected my opinion to remain negative, so was very surprised when I enjoyed my second playing. Subsequent playing has sustained this new view; the game is entertaining, and I enjoy playing it. No, Journey is not aimed at folks who crave a deep, strategy-laden challenge. It falls on the lighter side of the strategy scale. What it does offer is a pleasant experience that involves collecting cards, and using those cards in the optimum fashion to increase one’s odds of collecting the proper combination of fossils and gems. A considerable amount of what happens is random in nature and players must often react to these circumstances. There are steps a player can take to somewhat prepare for these potential occurrences but these steps are not foolproof. Still, these occurrences are not devastating and they generally do not destroy a player’s plans or chance at winning. My biggest worry is that the game can last a bit longer than it should. Most of my games have clocked in at an hour and a quarter, which is a tad bit long for a game of this nature. The longest phase of the game is the first one, when explorers are being moved through the cave. Due to the card mix, this usually results in all explorers advancing at a slow but steady pace. I would love to see this phase of the game shortened.